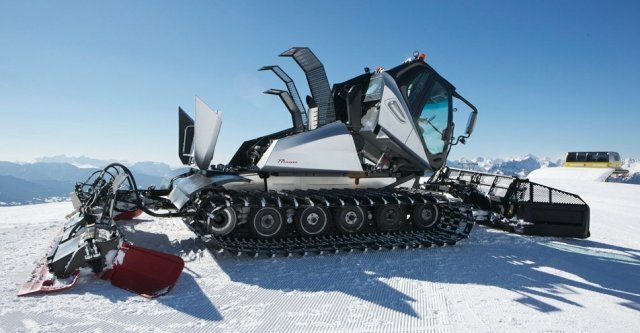 After PRINOTH had brought the Leitwolf to life in 2002, the new version of the classic snow cat now comes to life. Born out of persistent further development, the new Leitwolf impresses with a variety of innovative concepts and makes it the first of its class with the new exhaust emission technology. 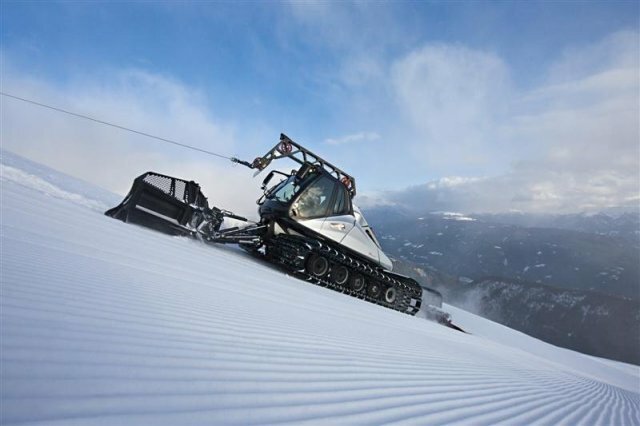 PRINOTH has brought up the Leitwolf to new limits of performance: increased working width, improved thrust power, improved climbing characteristics, environmental soundness due to Euromot III B and modern cab comfort with ergonomic control elements allow for perfect snow grooming across the entire width of ski runs. New pump generation: The new pump generation achieves a better performance through higher maximum pressure and increased oil flow rate. This enables the achievement of an increased maximum power; the diesel engine can be operated in the optimum speed range. Consequently, the engine uses less grams of diesel to produce 1 kWh of power. 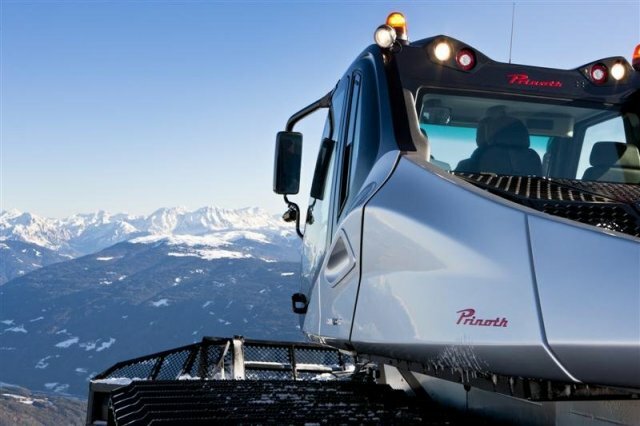 Active undercarriage: The active undercarriage enables a combination of climbing ability and ease of turning. The track working surface can be increased or decreased by lifting the undercarriage. The reduced working surface ensures an extreme ease of turning, while an increase ensures climbing capacities and thrust power, which are further boosted by the low centre of gravity of the vehicle. Parallel offset of the tiller: Another highlight presented by PRINOTH is the parallel offset of the tiller. Even when riding at an angle, the lateral offset ensures perfect ski runs across the entire width of a slope without smudging the edges. 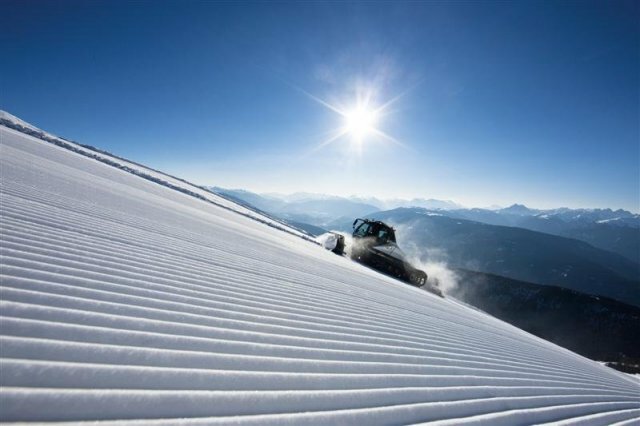 The driver can determine the type of trailing characteristics of the tiller himself and select, depending on the situation, parallel offset or free trailing mode, which opens up completely new possibilities for snow grooming for the first time. 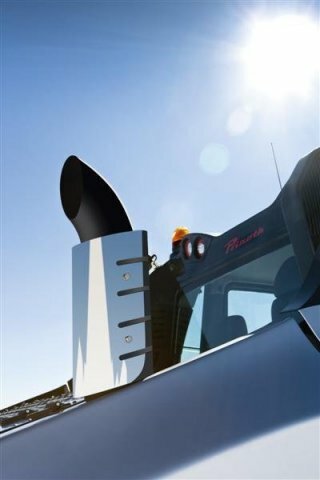 Engine: PRINOTH state-of-the-art exhaust emission technology is in line with its strong environmental orientation. With 2,200 Nm of torque and 455 hp, the new Leitwolf is the first series-produced vehicle in the word to comply with the new Euromot III B exhaust emission standard. 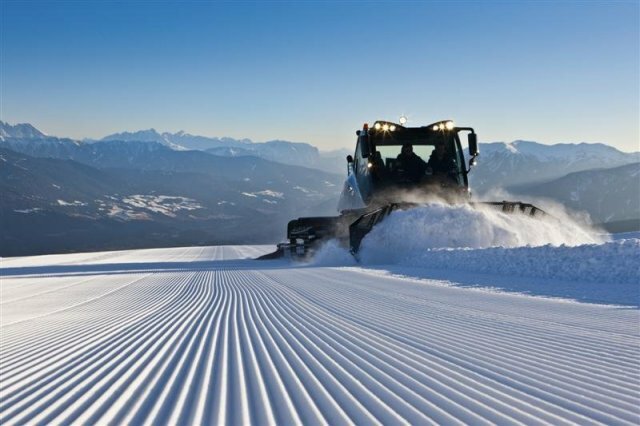 By reducing nitrogen emissions by 50% and reducing particulate emissions by 90%, PRINOTH comes considerably closer to clean and environmentally friendly snow grooming in the context of its “Clean Motion” efforts. Valve technology: Precise blade control for efficient working and new movement adjustment options. PRINOTH revolutionises the concept of valve technology and so improves serviceability to a high degree. The number of different spare parts was reduced through the use of a smaller number of different hydraulic components, which is mainly reflected by the service expenses and helps the customers to cut down on costs. In addition, a diagnostic program provides – thanks to electronic valve control – information about the status and about malfunctions and helps the driver to identify the cause more easily and to solve the problem fast. Dynamic/comfort suspension: In addition to the active undercarriage enabling an adjustment of the track working surface, the new Leitwolf is also equipped with an adjustable suspension system. Consequently, the suspension effect can be adapted flexibly to the respective situation because the driver can adjust the degree of stiffness of the undercarriage and manually select a dynamic or comfort mode. Individualised configuration options for the steering system and the seat position enable the customers to equip their new Leitwolf at their convenience and according to their requirements. 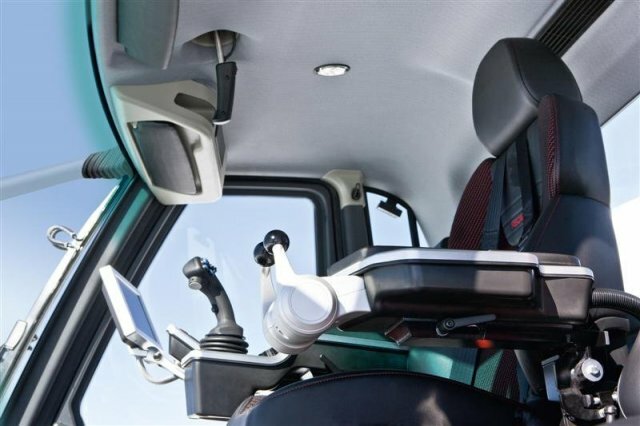 Cab: The ergonomic cab equipment ensures maximum comfort and pleasant working conditions for the driver. The new monitor technology of the display with a 600 MHz processor ensures a faster image build-up and a high processing capacity. An excellent image quality and the well-structured preparation of the information guarantee the necessary overview. Furthermore, a second keypad is used to control undercarriage and winch in an efficient manner.